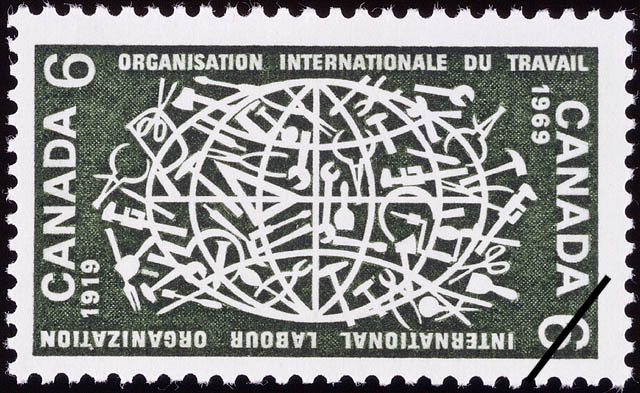 The value of a International Labour Organization, 1919-1969 - 6 cents 1969 stamp depends on several factors such as quality and wear, supply and demand, rarity, finish and more. Values in the section are based on the market, trends, auctions and recognized books, publications and catalogs. This section also includes information on errors and varieties and characteristics. The International Labour Organization's continued endeavours to promote lasting peace through social justice are commemorated by a Canada Post Office stamp marking the 50th Anniversary of the Intergovernmental groups establishment in 1919. Emerging from peace settlements following the devastation of World War I, the I.L.O., created as part of the Treaty of Versailles on 11th April, has for its motto: "Poverty anywhere constitutes a danger of prosperity everywhere". The unique tripartie structure, embracing Governments, Employers and Workers, has proved to be a basis of strength which helped the organization to survive, even when the League of Nations dissolved after World War II. In 1946 the I.L.O. became the first major specialized agency to come under a new world body, the United Nations. Canada, one to the founding members and a staunch supporter through five decades, derives a near-paternalistic interest from the fact that Montreal was the seat of the I.L.O. through the years 1940-1947 when refuge was sought from war ravaged Europe. The year 1947 saw a re-establishment at the permanent headquarters in Geneva, Switzerland. The International Labour Conference, supreme authority of the I.L.O., meets annually; attending from each participating nation are four delegates, two as government representatives and one each from Employers and Workers. Representatives of Employers or Workers are not bound to present a united front with representatives of their own Government. In strength the I.L.O. has grown from a 1948 membership of 52 States to some 115; funds for an annual budget in excess of sixteen million dollars are provided through contributions by member States. Deliberations set international labour standards and provide a forum for the discussion of social and labour questions; forward-looking plans for the year long celebration of the I.L.O. 's Anniversary include the development of a World Employment Programme. An executive group of 48, the Governing Body, normally meets four times a year; this is composed of 24 representatives of Governments, 12 Employers and 12 Workers. Some writers have commented that Plato, 2500 years ago, attempted to clarify the concept of justice in the human society of his Greece of that era; his beliefs were that each individual should have conditions providing dignity and liberty, and that each individual should develop his talents for the benefit of the whole society. The Industrial Revolution, accelerated in the 19th Century, brought with it profound social changes which stirred the human conscience. In 1891 an international conference in Berlin, attended by 14 countries, considered the prohibition of work in mines by women and boys under 14, further suggestions called for the abolition of labour by children under 12; although unsuccessful in its immediate aims, the Berlin gathering led to a series of international conclaves, and eventually to establishment of the I.L.O. whose avowed objective is a universal and lasting peace based on social justice. The I.L.O. stamp issued by Canada is the creation of a distinguished Montreal designer, Julien Hébert, a native of Rigaud, Que. The Expo 67 Symbol, designed by Mr. Hébert, became familiar to millions of people in Canada and throughout the world; his impressive list of achievements in the design field include a suspended ceiling for the new National Arts Centre Opera House in Ottawa.